Like an elephant taking an ice skating lesson in August or a rattlesnake giving up slithering to play secondary percussion in ophidiophobic folk trio, the play seemed doomed to endure a starkly miserable failure before it even occurred. It had to happen, though, and everyone knew it. With Louisville owning the line all night, Jon Hilliman averaging less than three yards plus a pile-on per carry, and the scoreboard screaming “It’s fourth and goal and Boston College is down by 12 so damnit, Tyler, you have to do something amazing and you have to do it now,” Murphy’s valiant rollout to the right of the pocket shocked no one, least of all Louisville. The play exploded spectacularly in BC’s face like a fat ton of nitroglycerin as two of Bobby Petrino’s freakishly fast minions tore through the inside and outside lanes and gave chase to Murphy. Turning his back to the end zone, Murphy flew to the 15, to the 20, to the 25—desperately searching for a seam or a corner to slingshot around and resurrect his Eagles, but all he found was a growing swarm of bloodthirsty Cardinals. Surrendering to his rapidly impending doom at the 26 yard line, Murphy pivoted, leaned back, and chucked a duck eight yards short of a BC lifeline and into the burly embrace of defensive end Sheldon Rankins. The sight of any 305-pound man catching and clutching a football with glee is certainly a delightful experience, but the scene was rendered somber by the sheer misery spawning in Alumni Stadium as the remaining factions of the student section spilled for the exits, and those unwilling to leave early wondered how things could get any worse—after all, what’s more painful than three momentum-killing picks? They would only have to wait one possession to find out. Murphy would throw his fourth pick of the night on his last snap of the game to finally seppuku the Eagles and shore up the 38-19 loss less than three minutes later. The latter half of that statement is definitely true, and Saturday night surely marked Murphy’s worst game and poorest display of decision making so far this season, but placing the blame solely on Murphy’s shoulders for nearly four hours of ACC torture would be short sighted. First of all, the only reason that he had to throw that ball and BC needed to go for it on fourth and desperation was because BC’s gothic nightmare of extra points continued early in the night. Like Frankenstein’s monster rising from the mists of Chestnut Hill to haunt Alumni again, Joey Launceford doinked his point after attempt off the goal post, ensuring BC’s streak of punch-drunk-peg-leg-baby-seal-esque kicking would continue for at least another Saturday. Apparently giving up on the extra point overall, BC would go on to fail at a two-point conversion following Bobby Wolford’s third quarter touchdown. Special teams disasters plagued BC all night. Alex the-punting-god-among-men Howell proved brilliant again and averaged 51.7 yards on three punts, but nearly had his leg taken off when his punt was blocked after an attempt to push for points before the half. BC took costly penalties throughout the game, and kudos to Louisville for doing its homework—the Cardinals burst the Justin Simmons bubble wide open, targeting his side of the field with a cruel relentlessness. BC’s third down defense struggled throughout the night—Louisville converted six of 13 attempts, including some back-breaking long ones. “Don’t know,” answered a seething Manny Asprilla when asked where it broke down on third and long so many times. On offense, BC failed to establish the run and struggled on the line and with quarterback protection. Sherman Alston led the team with 43 yards off two carries, and despite scoring twice, Hilliman picked up a mere 42 yards on 17 attempts. Louisville took away the perimeter and loaded up the inside, jamming BC up all night, and Gerod Holliman ruled the air with Spiderman hands. Murphy might take the heat for this one, but the Cardinals outmatched BC on Saturday night in coaching, defense, special teams, and offense. 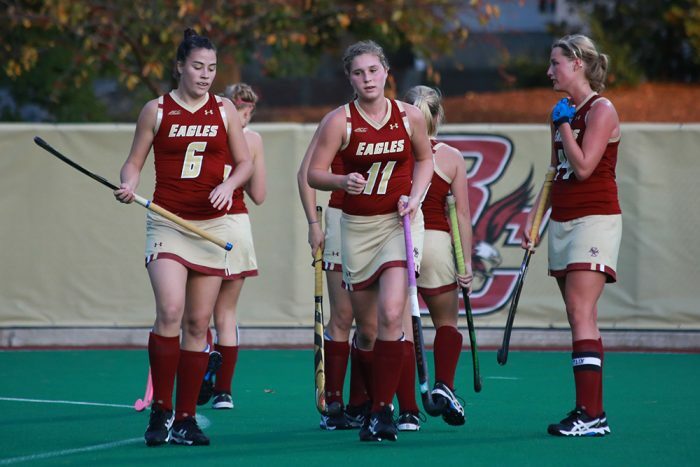 The Eagles came in riding hot, but ultimately left with a cold reminder that despite the huge gains over the last two years, BC is not yet a premier ACC program again.